Two men from London are preparing to kayak 1,600 miles along the River Danube this summer in the name of charity. Dan Clark-Basten and neighbour Ian Westmoreland, who are hoping to raise £20,000 for Harlington Hospice in the London Borough of Hillingdon, will travel through eight countries on their epic adventure of a lifetime. Ulm in Germany is the start line. They will leave here on Saturday 7 June, before hoping to finish at the Danube Delta in Romania, on the coast of the Black Sea, some 40 days later - clocking up an average of 40 miles per day. Whether you're embarking on worldwide challenge to raise money for charity, or simply sunning yourself on a beach in a far-flung exotic location, travel insurance can help protect you on your travels. 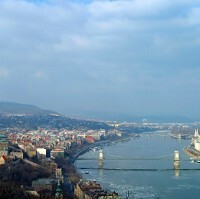 Both men are under no illusion as to how hard the journey on the Danube will be, yet they are extremely eager to get started. Dan, from Sipson in Hillingdon, has been a keen charity supporter for years along with his wife Jackie and has previously completed in a number of events including parachute jumps, fun runs, and the Three Peaks Challenge. Ian, meanwhile, an urban designer and environmental activist, only stepped up to join Dan a few weeks ago after Dan's father had to pull out of the trip due to injury. They will receive no support on their travels, making the task ahead of them even harder. The expedition will be entirely self-supported with all their equipment and supplies carried on board their boats. Riverbanks will be their accommodation most nights, with the occasional stopover in a camp site or hostel providing some luxury, while they will stay connected through the internet along the way using solar power.